2. Stand alone rotary die cutter with or without flexo printing unit. 3. This machine features die cutting, creasing and cutting hand holes. Suitable for solid board and medium or small-caliper board. 4. 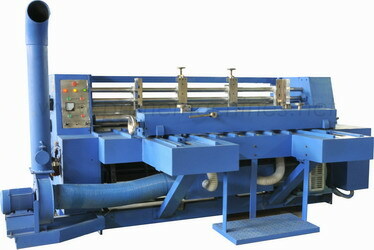 It features high precision die-cutting with medium speed, and easy operation. 5. It is designed for double roll rotary pressing, electromagnetic speed adjustment, and manual die-cutting register adjustment. 6. 40mm transverse moving of anvil roller controlled by the mechanical device. Copyrights Reserved © 2009. PRIME Mechanical Works (Pvt) Ltd.